Advocates and city officials unveil a $2.4 billion, 10-year plan to shutter some schools and bring the rest up to date. 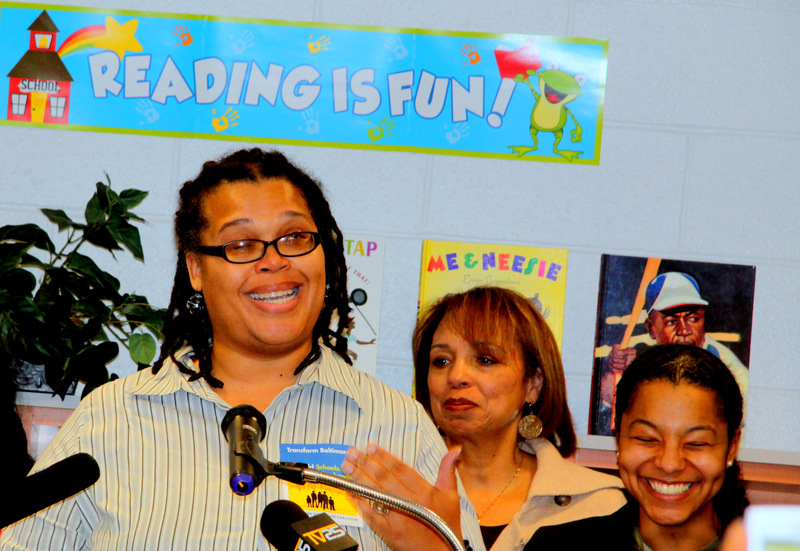 Above: Reacting to the announcement (from left): parent Sherrell Savage, Carol Reckling of Child First Authority, and Yasmene Mumby of the Baltimore Education Coalition. As they have in the past as Baltimore’s population has plummeted, city school officials announced a list of school buildings to be closed yesterday. But this time the list of 26 proposed to be shuttered in the next decade came with another more hopeful one – 136 to be rehabilitated or rebuilt over that time. It’s part of the ambitious $2.4 billion 10-year plan being undertaken by school officials and political leaders – after years of being “shamed,” as one speaker put it, by the ACLU and other advocates – to take on the mammoth task of fixing the city’s shabby, aging school facilities. Yesterday, as the list and some new details of the plan were unveiled at Calvin M. Rodwell Elementary School, many of those advocates and parents were clearly overwhelmed. “There are not many moments when you realize you’re standing on the edge of something great,” said Sherelle Savage, a parent of three city school students and a member of the Baltimore Education Coalition, wiping away tears. 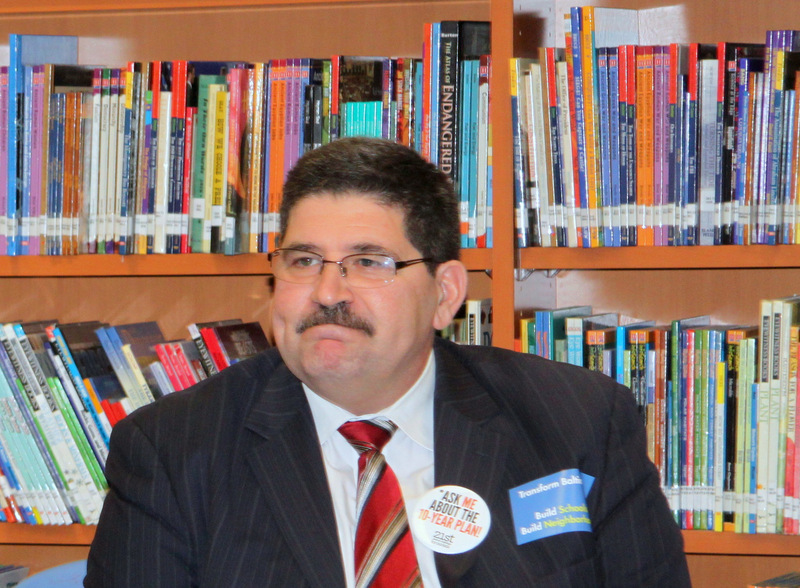 Meanwhile, amid the celebration and upbeat remarks by Mayor Stephanie Rawlings-Blake, schools CEO Andres Alonso and others, many speakers noted that they have a hard road ahead. At the upcoming session of the state legislature, city lawmakers hope to win passage of a $32 million block grant bill, which the school system would use to ultimately leverage more than the $2 billion they estimate is needed to modernize Maryland’s most physically antiquated school system. Making the task still tougher, however, may be the accounts of school system waste and mismanagement disclosed in audit reports released this year, fueling long-standing skepticism about money management at North Avenue. Speaking after the event, school commissioner Bob Heck acknowledged that the audit findings hurt their cause but argued that they shouldn’t. Alonso and Heck both pointed to the entity to be created as part of the 10-year renovation plan, the Baltimore Public School Construction Authority. “We are going to keep it separate,” Alonso said, speaking with The Brew. He likened the organization to the Maryland Stadium Authority and said legislation to create it would be part of their campaign in Annapolis. The even more pressing challenge for school officials is the battle they face not in Annapolis but in the city over the schools to be shut permanently, including four to be closed after this school year – Baltimore Rising Star Academy, Garrison Middle, Patapsco Elementary/Middle, and William C. March Middle. At Northwestern High School, which is slated to be shut during the 2015-2016 school year, parents and students were stunned yesterday to hear that the school again faces closure. But consolidation must accompany renovation, officials said. “We can’t go to Annapolis and say ‘gimme’ . 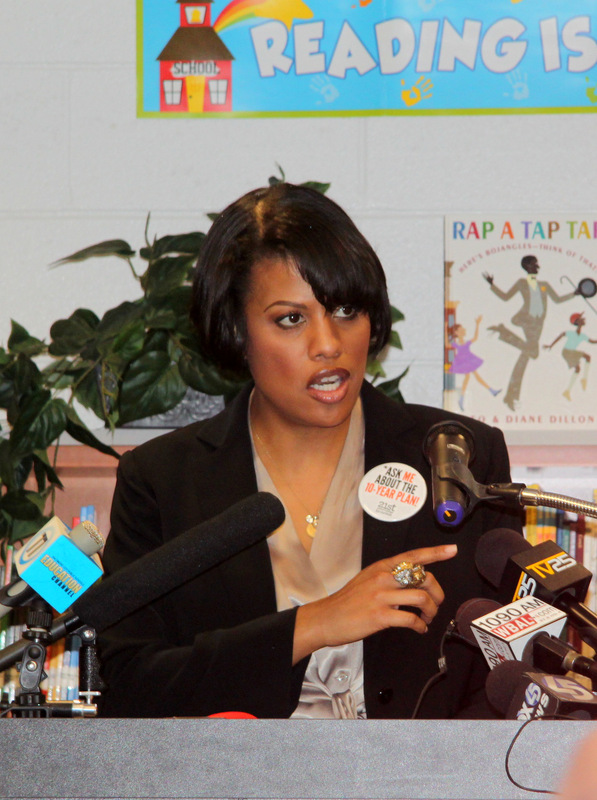 . . with schools that are 50% full,” Rawlings-Blake said yesterday. By year 2025, he said, they’ll go from 163 school, campuses to 137 under the plan, which the school board must approve. The plan would ensure they’re using 77% of their available space, instead of the current 65%, Alonso added. While many across the city were expressing the concern over neighborhood schools, others were openly lobbying to have their schools benefit from any new funding first. “We have exceeded our capacity by 119%,” said Mary Booker, Calvin Rodwell’s principal, tossing in a pitch for her school to get more space for teaching and special programs, like their unique culinary arts program. As the advocates faced a phalanx of eight television cameras and girded for the next stage in their battle, they had the usual array of supporters by their side – city and state lawmakers, ministers and community activists. And as always, there were teachers and parents with fresh accounts of the dilapidated surroundings for city school students. “These are unpardonable conditions,” said Leon Pryora kindergarten teacher at Calvin Rodwell who talked about seeing pieces of ceiling tile fall from a classroom while it was in use.